Were you aware that not everyone who “likes” your page on Facebook will see your posts? Facebook has an algorithm that decides who sees what you post. If someone is a fan of your page, it doesn’t automatically mean they will see it on their timeline. The name of the algorithm is called EdgeRank. Facebook decides what will show up on your news feed based on how much you have interacted with the page in the past. There is a chance that you will Like a page, and never see an update on your News Feed. There is a lot of information that is being shared on Facebook, and it would be overwhelming to anyone if you received every post. Twitter, on the other hand, will show you every post of everyone that you follow. EdgeRank weighs posts on three things; affinity, weight and time. Affinity is the relationship that the user has with the page or the person who created it. Weight is based on the type of post it is. As seen in my previous post, Facebook gives more attention to links, photos and videos. Rich content is king! Time is based on how recent the post was made.. I currently consult Ask Big Questions with their Social Media and below is an image of their Facebook Page. If you are an admin for a page, you will gain access to “Insights,” which gives you statistical data on your posts. There are other features in that panel, but I want to take a look at the numbers per post section. As of April 9th, 2012 at 11:30pm. Ask Big Questions has 471 likes. There are two posts I want to showcase. The one circled in green is the highest viewed post to date. (the word you can’t read is “Reach.” Reach is the number of News Feeds your post has reached. 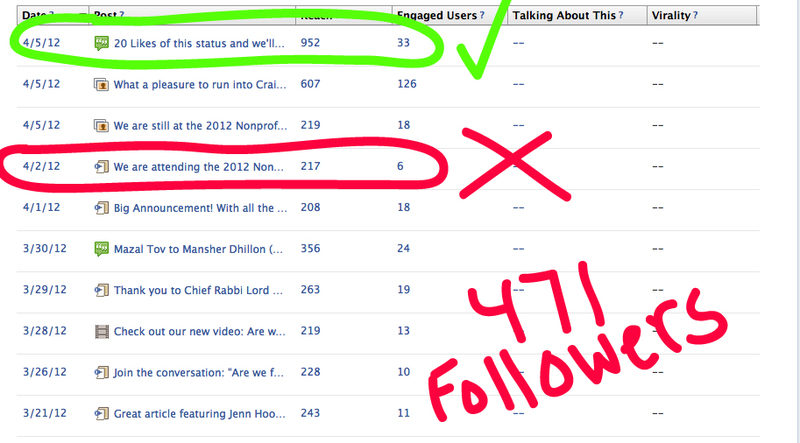 Ask Big Questions had 471 followers, but the post circled in Green (see image below) reached 952 News Feeds. Why was this? We used a “Call to action” post. We asked for 20 likes and in exchange, we offered to post something that would brighten their day. We reached our goal within 2 hours and posted a video of a baby laughing historically at ripping paper. We didn’t get many comments after we posted the video, but perhaps we should have created a new post for the video, and not posted it in the comments section. When we solicit a similar call to action, we’ll shoot for a higher number of likes. means, and they aren’t meant to be used on Facebook. What do we learn from all this? Facebook gives priority to posts and they may not be seen on every one of your fan’s pages. The more engaging you can be with your posts, the more people are going to interact with it. Post a link, show a picture, tag it or offer up a video for people to enjoy! 2. Facebook is not Twitter! – Don’t use hashtags (#) or (@) symbols on Facebook. Leave those to Twitter! 3. Use the insights panel of the page you are an admin for to see what posts are working for you. This is obvious, but the more people who Like and interact with your page, the more Reach your post will get! 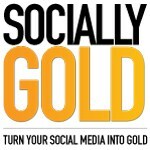 LIKE SociallyGold US ON FACEBOOK!